So it will be a busy weekend at Landmark Books with two great events which are free to the public. For details you can call us at 231-922-7225 and we will be happy to help. Tonight we are offering a free discussion called ‘Book Collecting 101’. The discussion will focus on identifying First Edition books and how to separate them from Book-Club Editions. We have a free handout and I will share some secrets I have learned over my twenty years of collecting on what to look for when searching for a collector book. There will also be a brief question and answer session as well and we will have examples on hand so you can get a feel for what you are doing. The event begins at 6:00PM and will run until 7:00PM. Saturday afternoon we are very excited to be hosting our first fiction reading. 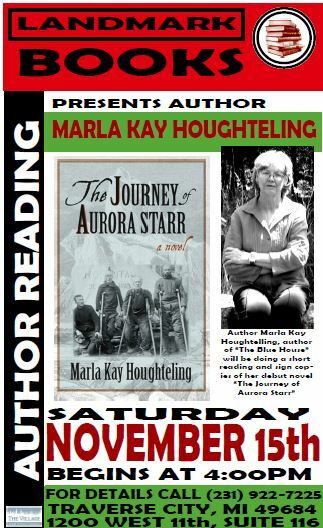 We will be hosting a reading by Harbor Springs author Marla Kay Houghteling. She will be reading from her first novel, ‘The Journey of Aurora Starr’. The novel is set during the Alaskan gold rush of 1898 and centers on the romance between Martin and his wife Aurora. Following the reading she will have books available and will be signing copies. She will also have copies of her first book of poetry available for purchase as well called ‘The Blue House’. This event will begin at 4:00PM. We hope to see everyone here at Landmark Books, Traverse City’s premier used bookstore for these two exciting events!